My kids really love their Mickey Mote DVDs and are excited to add the latest title to their collection. The Mickey Mouse Clubhouse- Mickey’s Great Outdoors play set includes a Mickey Mote and 2 DVD discs and is being released on 5/24/11. This DVD play set is tons of fun for preschool aged children who can actually interact with the onscreen episode using a specially designed Mickey Mote remote control that is perfect for little hands. We are going camping in a wooded mountain cabin in Virginia for two weeks this summer and Mickey’s Great Outdoors is sure to provide hours of fun for our family. I love that it teaches children about the joys of camping, fishing and spending time outdoors. This two disc combo pack includes five episodes from the Mickey Mouse Clubhouse TV show featuring the all new and never before seen, Mickey’s Fish Story episode, Mickey’s Campout (our family favorite), Mickey and Minnie’s Jungle Safari, Daisy in the Sky and Daisy’s Grasshopper. 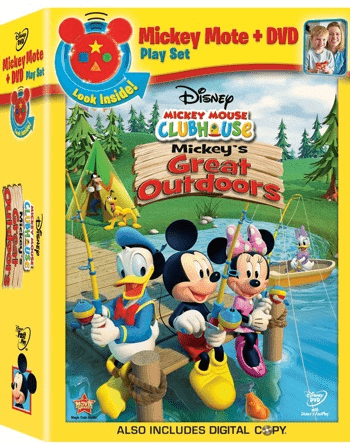 There is almost two hours of interactive play for children with the Mickey’s Great Outdoors DVD set. If you do not yet have a Disney Mickey Mote then you are invited to read my prior review and learn all about this fun and interactive product. It is easy for parents to set up and it works with any Disney Preschool DVD that includes the Discovery Mode™ feature. This provides preschoolers with an interactive “Watch & Play” feature on the DVD that has two levels of increasingly challenging play. You can also simply watch it in regular mode too if you prefer but my kids absolutely love using their interactive Mickey Mote. I recently learned the Digital Copy allows me to download all the episodes onto a secondary device like my computer which makes it easy and portable for “on the go” access. What a neat feature! As you get ready for summer fun, Disney Mickey Mouse Clubhouse-Mickey’s Great Outdoors would be perfect for preschoolers. Releasing by Walt Disney Studios Home Entertainment on 5/24, this new title set including a Mickey Mote will be available at nationwide retailers for only $29.99 U.S / $35.99 Canada or the two disc combo including digital disc is $19.99 U.S./$24.99 Canada. OMG! My boys would go insane for this! My 3yo lives for Mickey!